On 8 August 2018 the students of K.R. 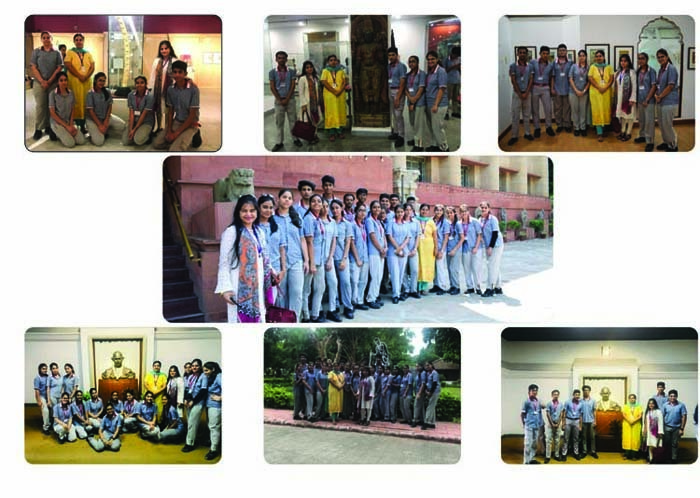 Mangalam World School, Vikaspuri with absolute ebullience and vivacity visited the National Museum and Gandhi Museum situated in the heart of Lutyens Delhi; both related to the colossal history of our country and the riveting life of the ‘Father of the Nation’-Mahatma Gandhi. The national museum bestowed the students with immense portions of the beguiling history of our country ranging from the time of royal demesne to the imperial entity. The artifacts garnered in the museum allowed the students to visually intercept the beliefs and practices that were followed by people across the scale of time. The trip at Gandhi Museum started with the students of K.R. Mangalam World School idolizing the prodigious statue of Gandhi ji situated outside the museum that eloquently symbolizes the meaningful hard work and nationalistic approach towards perseverance. Every belonging of Gandhi ji in the museum read a descript of content or a spell binding story that indoctrinate that life might offer excruciating moments which will generate a feeling of helplessness and backing out, but what takes courage is to stand up against every problem even if you have to take bullets onto your chest. In the museum there were even the khadi dhoti and Kurta that Gandhi ji was wearing when he was shot to death but what was more symbolic was the message that was engraved on the wall that reads “My Life was my Message”.